Developments in vertical takeoff and landing aircraft (VTOLs) could revolutionize travel in the near future. These “air taxis” will fly rapid, short-haul flights, such as going from downtown Washington, DC, to Dulles Airport in 10 minutes. Current regulatory proposals would centralize air taxi traffic management into a single interconnected sys­tem. However, these proposals would likely create regulatory bottlenecks that would impede the growth of this new transportation and manufacturing sector. Once these flights are autonomous and cost of service falls, helipad-like vertiports could see hundreds of air taxi take­offs and landings per hour. To deal with this airspace congestion, current regulatory plans would require regula­tors to referee disputes between air taxi operators and their access to routes and vertiports. Brent Skorup explores these issues in “Auctioning Airspace.” Instead of imposing a centralized traffic management sys­tem and the mandated sharing of air taxi routes and vertiports, regulators should demarcate and auction aerial corri­dors—highways in the sky—much as the government auctions multiyear leases to federal assets like radio spec­trum and offshore energy sites. Lift regulatory burdens. Operators would be freer to upgrade air taxi traffic management systems and verti­ports as technology improves. Improve property right protection. Multiyear lease exclusivity would give operators certainty to finance the large costs of permitting, vertiport construction, electrical grid upgrades, and concessions. Free aviation regulators from commercial disputes. Regulators could focus on air taxi safety, including air­craft inspections, separation requirements, and emergency landing capabilities. Return billions of dollars of revenue for deficit reduction. Airspace auctions would generate revenue, much as auctions and sales of spectrum and oil site leases do. Result in underutilization. Regulators, who have only a weak incentive to maximize productive airspace use, would be bogged down in refereeing commercial disputes between operators. Create technology lock-in. A centralized traffic management system would require technology interoperabil­ity among service providers and make later modifications and innovations difficult to intro­duce. Harm competition. Shared routes and vertiports would unduly benefit the initial operators at the expense of later innovators, who would need to operate on a noninterference basis. Around the world, regulators and manufacturers are racing toward autonomous flight. 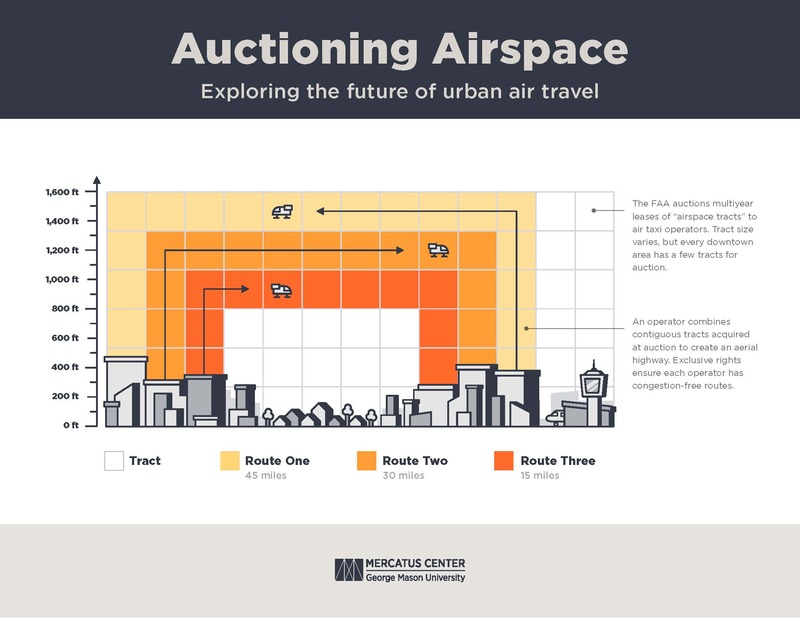 Demarcation and auction of air­space would allow for the rapid and safe deployment of an air taxi aviation and manufacturing industry in the United States.